This two hour webinar will focus on the common mistakes that banks need to be aware of relating to reviewing appraisal reports for minimum compliance with the Interagency Appraisal and Evaluation Guidelines as well as the most recent revisions to USPAP. This program focuses on current issues involving the appraisal compliance review process and contains information relevant to those who manage or are involved with the appraisal review process within a bank. A reference manual will be included with resources and sample appraisal review checklists. The instructor is a certified appraiser with extensive experience in ordering and reviewing appraisals and has completed thousands of compliance reviews since 2008. Members of the bank who are involved with writing or reviewing appraisal reports, as well as other employees that will rely on appraisals will be interested in attending this program. In addition to any appraisal department member, this may include credit officers, loan officers, credit analysts, loan review officers, credit administration supervisors, and loan assistants. About the Speaker: Eric Collinsworth, owner of Appraisal Advisory Associates, LLC and co-owner of Valuation Compliance Services, LLC has been actively involved in the appraisal industry since 2004. He received the Certified Residential Appraiser designation in 2006. For the first 4 years of his appraisal career, he worked exclusively on residential property appraisal in the Middle Tennessee area, with a focus on OREO and high-end properties. Since 2008, he has worked for and with community banks in Tennessee and throughout the Eastern United States. He served in a supervisory role for a multi-billion dollar financial institution headquartered in Middle Tennessee and was responsible for developing compliance forms, appraisal policies, appraisal reviews, appraisal training, and market analyses, as well as the management of the day to day operations of the appraisal department. 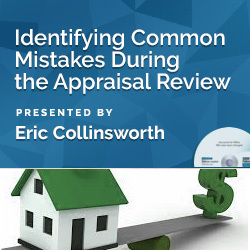 In October 2011, Eric formed Appraisal Advisory Associates, LLC in order to share his growing knowledge and expertise and to fill a need he recognized within smaller community banks for sound advice relating to the regulatory changes in the real estate valuation portion of the industry. He works closely with community bankers associations in many states to provide training on how to apply the regulatory requirements and guidelines for the real estate valuation process. In 2014, Valuation Compliance Services, LLC was created in order to provide appraisal and evaluation review services to a growing client base. Eric also works closely with a Nashville based appraisal management company to provide full appraisal management services to community banks. This program was recorded in its entirety in October 2017. The CD-ROM includes program slides, materials (if available) and follow-up Q & A document.